Jensen FF, chassis 119/051, was purchased new by the film producer, Elliott Kastner, famous for producing films such as, Where Eagles Dare (1968), The Long Goodbye (1973), Russian Roulette (1975), and The Missouri Breaks (1976). Kastner kept his Jensen FF until 2004, at which time it was acquired directly from him by the Museum. The Museum looks at the history of Kastner, and this celebrity car. Elliott Kastner was born on the 7th January 1933 in New York, USA. After completing his education at the University of Miami and Columbia, Kastner worked in the mail room at the William Morris Agency in New York, becoming a literary agent. He moved to Los Angeles and became a talent agent at the Music Corporation of America (MCA). When that agency merged with Decca Records, which owned Universal Pictures, Lew Wasserman, the president of MCA, made Kastner vice president of production at Universal. He worked there for two years before becoming an independent producer. Kastner’s first film as producer was Bus Riley’s Back in Town (1965) based on a script by William Inge and starring Ann-Margret and Michael Parks. Inge was so unhappy with the final result he requested his name be taken off the credits and the film was not a commercial or critical success. Shortly afterwards, Kastner formed Winkast Film Productions Ltd, along with Jerry Gershwin. Winkast Films operated under the umbrella of the huge Metro Goldwyn Mayer group. Kastner’s second film was Harper, which came out in 1966, and his third film was Kaliedoscope, starring Warren Beatty and Susannah York. Beatty and Kastner became good friends, and it was Beatty that would introduce Kastner to Tessa Kennedy, who he later married. Kastner with Beatty during filming of Kaliedoscope in 1966. 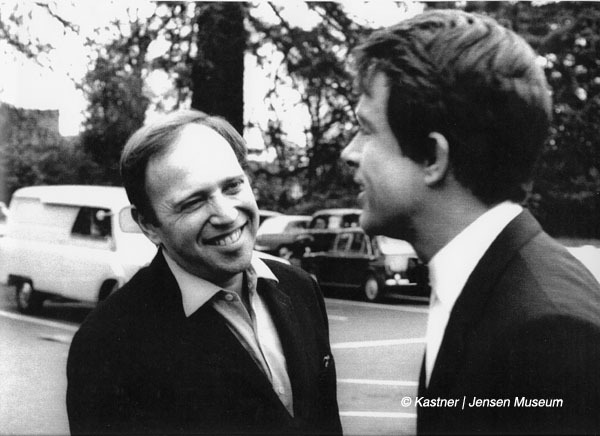 Key to Kastner’s long term success as a film producer, was his uncanny ability to get some of the cream of actors and actresses on board, such as Beatty, who had already starred in Kaliedoscope, along with others such as Marlon Brando, Richard Burton, Clint Eastwood, Roger Moore and Elizabeth Taylor. Kastner at a function with Taylor during the 1960s. Kastner’s sheer energy and charisma, meant he could pick the phone up to his band of actors and actresses, and the chances were they would say yes first, then ask about the film. Kastner’s films were becoming very successful financially, and it wasn’t long before he opened offices in New York, Beverly Hills and London. It was one thing managing to get the cream of actors and actresses on board, but the films needed financing, and this is also where Kastner’s cheek, tenacity, and ruthlessness won the day. One ingenious method for gaining finance was later mentioned by Roger Moore. Spending more time at Pinewood Studios, Kastner and his wife purchased a beautiful 20 acre property at nearby Runnymeade, and installed a full time butler and chauffeur. Since some business colleagues weren’t keen on running all the way out to Pinewood Studio’s, Kastner also purchased an apartment in the centre of London. This provided Kastner with a centrally based London office and also living accommodation, when he had to stay in London himself. Kastner had taken an interest in the new Italian designed Jensen Interceptor and FF cars, when they first appeared at the 1966 Motor Show. The Jensen FF, in particular, had inspired him, due to the revolutionary four-wheel-drive technology packed into such a wonderful sports car design. At that point, Kastner was driving an Aston Martin DB3. He had been lucky; outlining to Aston Martin that he would be willing to feature the Aston Martin in a couple of films, Kastner had been given the Aston for free. He would try the same tactic with Jensen Motors, but the reception wasn’t to be quite the same. With a free car not on the agenda, other angles would have to be looked at. In July 1967, Holt a director of WinKast Film Productions contacted Jensen Motors’ promotional company, Good Relations Ltd, they mentioned that Mr.Kastner would be interested in a Jensen car for use in two forthcoming films A Severed Head and Special Booking. The idea put forward by Winkast Films was to use a Jensen car for a period of four to six months on loan, Good Relations saw this as a wonderful method of promoting the new Italian styled Jensen car, and recommended that Jensen Motors accepted. That the film be released on one or two major circuits. That we (Jensen Motors Ltd) be paid for its use at a rate of £50 per month. That the car be leased for a maximum period of six months. 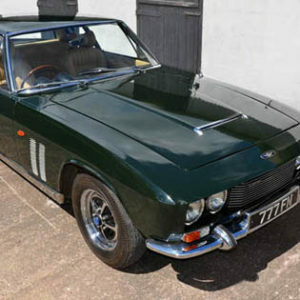 Once Jensen Motors accepted the idea of loaning a Jensen car to Winkast Film Productions Ltd, the film company ‘dropped a bombshell’ on both Good Relations Ltd and Jensen Motors. Both parties had just assumed Winkast Films would be wanting an Interceptor, but Kastner particularly wanted the four-wheel-drive Jensen FF. This would be difficult, as the initial limited production of FFs were all pre-sold. It would be impossible at this early stage to have an FF available for loaning. Correspondence between Good Relations and Jensen Motors confirmed that they could not spare an FF for a loan agreement. It was left for Good Relations to try and get Winkast Films to accept an Interceptor instead. While all this was going on, it had transpired the making of A Severed Head was now going to be postponed until the following Spring. A further letter arrived with Good Relations from Winkast Film Productions, in middle September. The letter stating Winkast would be making three films during 1968, in which they could give good coverage to a Jensen. Of greater interest was the fact Kastner was now interested to actually buy a Jensen FF outright. 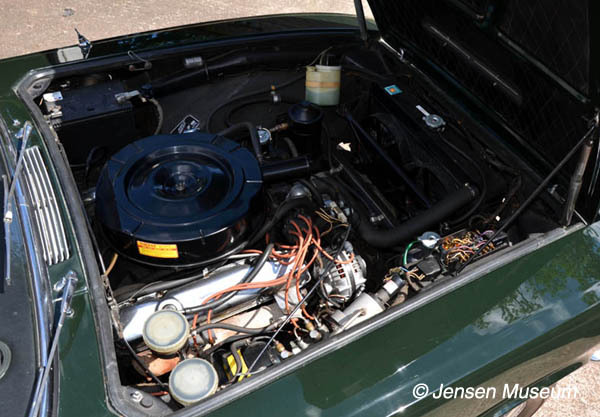 Kastner realised that Jensen were not about to give him one of these rare and saleable cars free, and so now, he wished to know what the best price might be for an FF, on the basis that Jensen Motors would gain from the film coverage. Kastner also asked, if Jensen motors would agree to provide a demonstration for him of both the Interceptor and the FF. Jensen Motors outlined a demonstration would most certainly be possible, albeit could Kastner wait until late October, just after the Earls Court Motor Show. The fact was, an FF was not available for Kastner to try out anywhere before that time. 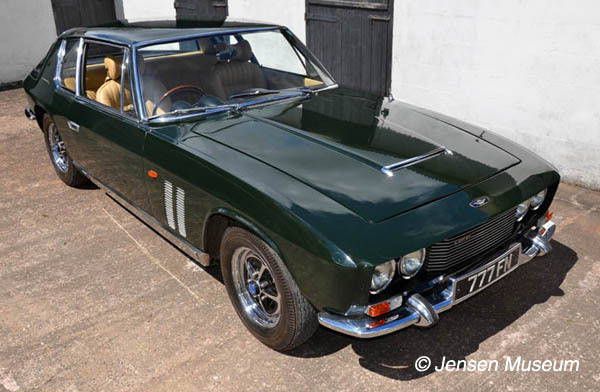 Not put off by such delays, Kastner attended the Earls Court Motor Show, and was particularly interested to view the Jensen FF, and to discuss its merits in comparison with the Interceptor. Directly after the show finished, Kastner managed to have a demonstration of both a Interceptor and an FF. This made him even more anxious to buy an FF, asking if it would be possible to buy the car with a standard dealer / distributor discount. In return Kastner re-iterated his promise to use the FF in at least two films. After some discussion within the boardroom of Jensen Motors, it was finally agreed to sell an FF to Winkast Film Productions with discount. Since the terms of their distribution meant that Jensen Motors should not sell new cars direct to private individuals or concerns, it was decided to sell the FF to Winkast Films via Charles Follett in London. Winkast Films would be given a ‘distributors’ discount of 15%. Follett themselves, would discreetly be given 5% for this ‘special’ sale. Kastner was unaware that the standard distributors discount was actually 20%, although this did fluctuate between 15% and 25% on occasions. It was made clear to Winkast Films that the earliest possible delivery date would be late April 1968. Kastner agreed to the terms set by Jensen Motors, and a letter sent to the company on 5th March confirmed his order of one new Jensen FF in conifer green with beige trim. Sales Manager, Wyndham Powell, wrote to Holt of Winkast Films on the 8th March, stating he was delighted Mr.Kastner had decided to purchase a Jensen FF. He went on to mention unless otherwise specified, the completed car would be finished with the usual mist grey roof. Finally, the typical delay in the production cycle was brought to Holt’s attention, it would be late May before Jensen Motors could deliver Mr.Kastner’s FF. Kastner was undecided about the roof colour, in contrast to most owners, there was always another agenda with his FF. Although he would be using the car primarily himself, Kastner would also be using it within at least two of his films, it was important the car looked right. In a moment of artistic detail, Kastner asked for the roof panel of his FF to be painted in the same colour beige as the interior, rather than in the usual mist grey. Powell stated the closest colors that were in their range were metallic fawn or honey fawn; colour samples were sent for Kastner’s attention. The outcome was Kastner deciding on a straight forward specification of conifer green with beige trim. Kastner consulted with writer, MacLean, and requested a war adventure film filled with mystery, suspense, and action. Six weeks later, MacLean delivered the script, at that time entitled Castle of Eagles. Kastner hated the title, and chose Where Eagles Dare instead. 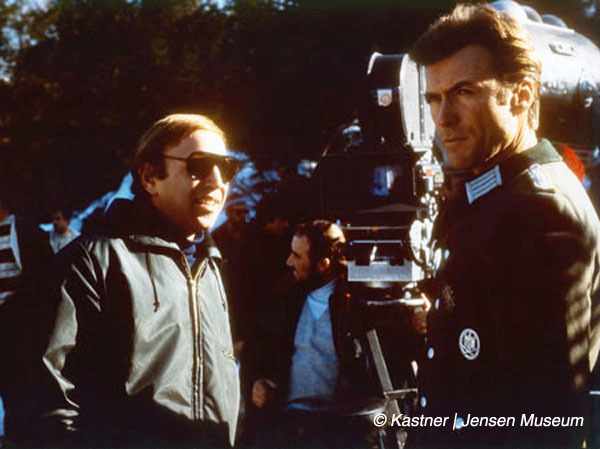 Kastner and Eastwood during the filming of Where Eagles Dare. The two leading actors enjoyed their own agendas during filming. Burton caused delays to filming due to drinking binges with his friends Peter O’Toole, Trevor Howard and Richard Harris. As part of his deal with MGM, Clint Eastwood took delivery of a Norton P11 motorcycle, which he ‘tested’ at Brands Hatch racetrack, something that he had been forbidden from doing by Kastner. Correctly, Kastner was concerned about filming, and insurance, in case of injury or worse. Outside of Burton and Eastwood enjoying their own pursuits, and some terrible weather in Austria while filming there, Where Eagles Dare was completed in July 1968. It had taken nearly seven months to film. Today, Where Eagles Dare, is concidered the best war film of all time. As the filming of Where Eagles Dare was coming to a close, Kastner’s new Jensen FF was virtually finished. 119/051 completed to Kastner’s specification, was made ready for transporting down to Charles Follett at the beginning of June 1968. Arriving at the Charles Follett Mayfair showroom, Kastner viewed his Jensen; which was parked strategically just in the front of the small entrance; he was pleased with his chosen colour scheme. Nigel Bligh, the Sales Manager at Follett greeted Kastner, and after completing the paperwork, ceremoniously handed over the keys to 119/051. The two men walked over to the FF, where upon Bligh opened the driver’s door and ushered Kastner to the driving seat, then walked around and settled into the passenger side. Once inside Bligh discussed the variety of aircraft looking instruments. With the pep talk finished, Bligh shook hands with Kastner and wished him the best of luck with his new purchase. Firing up the FF, Kastner couldn’t help but smile as he listened to the delicious sound of the V8. The gearshift was brought out of park, pulled backwards to drive and 119/051 gingerly moved forwards to the road. 119/051 then started on its maiden voyage to Pinewood Studios where Kastner had his own parking slot directly outside the front doors of the old manor house building. It was October 1968 by the time 119/051 had covered the first 1000 miles and was ready for its initial service. David Stanton, Kastner’s chauffeur and car maintenance man, drove the FF to Charles Follett on the 18th October for its first service and various rectification work. Issues raised related to some of the paintwork, which Kastner was less than pleased with. The bonnet, which had a tendency to lift at speeds in excess of 60mph and the boot lock, which could be problematic to open. 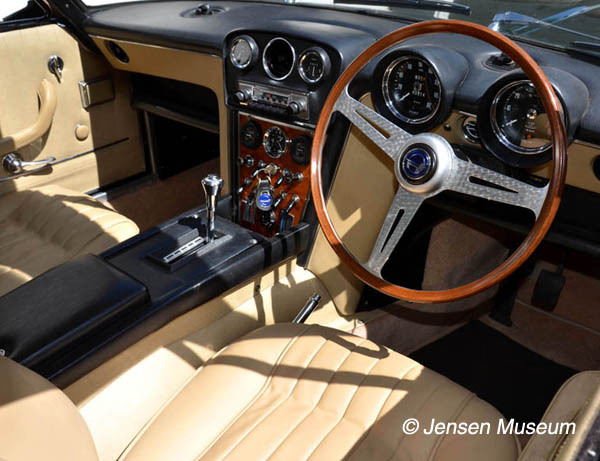 Jensen Motors offered Kastner a black hide steering wheel as a replacement, but he was not interested in this and retained the standard wood version. Follett undertook all the rectification work to 119/051 including re-trimming the crackle finish parts in black leather. With rectification work complete, Kastner’s chauffeur, Stanton, picked up the FF and drove the car back to Pinewood Studios. Outside of servicing periods, Stanton would look after Kastner’s cars, including the FF. Stanton was one of the honoured few, which were allowed to drive the Jensen. He didn’t smoke, and was viewed by Kastner as an extremely experienced and excellent driver. Back at Kastner’s home in Runnymeade, the FF shared stabling with a Mercedes-Benz 600. The Mercedes was used more than the FF, as it had ample room in the rear for clients. 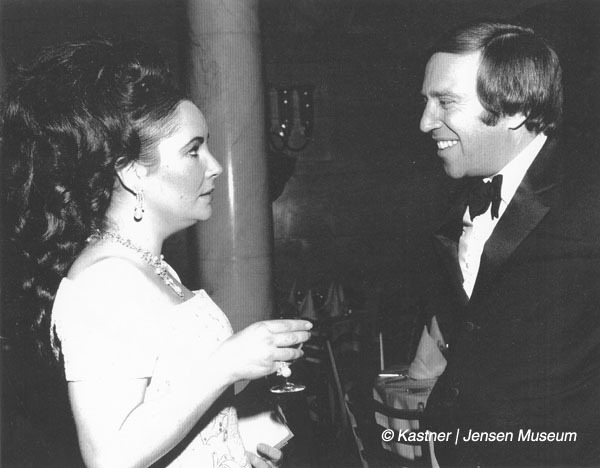 January 1969 saw another Kastner birthday and his wife had a special present for him. She had purchased a cherished registration number for the FF, ‘777 FN’; Kastner was absolutely delighted with his present. The cherished number was assigned to 119/051 shortly after completion of the film, Devil’s Widow | Ballard Of Tam Lin. 119/051 was one of the main cars featuring in this film produced by Kastner and Gershwin. The car still with its ULM 12F registration number in place. If Kastner’s Jensen was used during filming, Kastner would always be close by to make sure his car was being looked after. He had seen too many cars abused ‘on set’, and he wasn’t going to allow any abuse of his beloved Jensen FF. As Kastner stated to Woodhams, he had fallen in love with his FF, no previous car having held him so captivated as his four-wheel-drive Jensen. Not that 119/051 was without its usual selection of silly faults and poor paint quality, which required attention not long after purchase. The list starting mounting up for rectification at the time of the first service. Generally Kastner would always drive the FF himself, but enjoyed being chauffeured when the Mercedes-Benz 600 needed to be used. On most occasions, Kastner even took delight in washing and cleaning the FF, making a point to always have a good supply of the very best quality chamois leathers for leathering down the car after washing. When Kastner had to stay in London, 119/051 had to be left outside the apartment. He had a special hose point plumbed into the building, allowing an accessible hosing point from the building to the street. He would get up especially early to allow time to wash, hose down the Jensen and leather it off, before driving down to Pinewood Studios. Marlon Brando and a colleague took the practical joking further; purchasing a joke ‘dogs mess’ and placing it on the driving seat of the FF. Brando got his mischievous cohort to innocently mention to Kastner that he had seen a cat get in the open window of the car. Brando was hiding around the corner when Kastner came walking over to his FF. Seeing the dog mess on the seat, Kastner went red with rage. The verbal obscenities coming out of Kastner’s mouth only stopped when he saw Brando literally falling on the ground with laughter. Amongst the multitude of films Kastner was producing, one filmed in Canada used a copper coloured MK.III Jensen Interceptor as ‘lead’ car. The film, Russian Roulette, starring George Segal, was released in 1975. Throughout the 1970s and into the 1980s, Kastner continued to use his FF albeit sparingly (he didn’t want to put too much mileage on the car). By the end of the 1980s, early 1990s, Kastner was becoming involved in a new ‘pet project’, the world of mergers and acquisitions. The new ‘project’ took Kastner back to the States more frequently. This led Kastner and a partner to buy 70% of Cinema Group Home video, a video distribution company, based in Los Angeles. Kastner also bought an interest in Roger Corman’s Concorde New Horizons Pictures, for a reputed $100,000 million dollars. With business keeping Kastner Stateside, 119/051 remained at his Runnymeade property garaged and unused. The FF had covered just over 40,000 miles from new, here 119/051 remained until 2004. 119/051 was acquired direct from Kastner for the Museum collection in November of that year, having covered just over 40,000 miles from new. The focus of the Museum is always towards conservation rather than restoration. The near perfect long-term storage of 119/051 undoubtedly helped to conserve this car. When the Museum acquired the car in 2004, it remained largely on its original paint. The interior survived in exceptionally good condition, although the carpets had deteoriated. The decision was made to stabilise areas of the body and to treat the leather. Some mechanical recommisioning was required. All the trim modifications requested by Kastner, such as leather finished radio console etc, remain in place. The Museum will conserve all the trim modifcations requested by Kastner. Body: The car is of sound structure, and remains largely on its original cellulose paint. The only areas of rust were around the hinges on the bonnet frame, and on one area towards the passenger side under the rear valance. The bonnet frame was repaired and repainted in cellulose, as was the area to the rear valance. At this same time all areas were subjected to a treatment of waxoyl in an effort to stabilise them for the immediate future. Mechanics: Recommissioning of the mechanics has taken place, including work to the braking system, and rebuilding the transmission. Interior: Interior remains largely original, although a new carpet set had to be fitted. The leather was cleaned, treated and coloured back to its original shade (due to typical fading of the original beige colour). The Museum managed to acquire new old stock 1960s vinyl carpet edge trim, which matched the original exactly. This was used to edge the new Wilton carpet. The old carpet set was carefully cleaned and archived. The car retains its original Radiomobile 980 radio.